Just like any other creative endeavor, the art and craft of the voiceover has its success stories; people who set a standard of excellence that has been rarely matched since, as well as those folks who continue to carry the torch and make use of the platforms that the Internet and broadband access have made available to everyone. Let’s cast a quick glance at some of them. While no longer with us, a discussion on voiceovers would be incomplete without referring to one of the industry’s greatest legends—a man who single-handedly defined much of what has become standard practice today. Particularly famous for his movie trailers, Don (1940-2008) became identified with the phrase “In a world…” because trailers often started that way, or contained the phrase in the script. He’s probably said that phrase more than anybody who has ever lived, and the phrase was so often copied and overused it has become something of an industry cliché. He started as a recording engineer and editor, then wanted to be a film editor and producer. So he went into business with Floyd Peterson (a famous producer in the 1960s) and they produced advertising exclusively for the movie industry. One day, he filled in for an unavailable voice actor so they had recordings to present to MGM. After MGM bought the spots, LaFontaine began his career as a voiceover artist. At his peak, he was voicing about 60 promotions a week, and sometimes recorded as many as 35 over the course of a single day. LaFontaine lent his distinctive voice to thousands of movie trailers during his career, spanning every genre from every major film studio. Don was the state of the art for the industry, his natural style and inflections becoming the norm. Don has been an inspiration to countless voice actors and has left both a strong legacy and lessons worth learning. He believed someone with a unique and versatile voice could make anything out of it. He often said his philosophy was that you have to really believe what you’re reading, and had to bring your personal experience to voice acting. If you did, every reading you did would be unique. Career voice actors can earn $250,000 to $500,000 a year for consistent work. An elite few, like Don LaFontaine, have pulled down more than a million dollars a year. In 2016, Don LaFontaine’s net worth was estimated to be $80 Million. Don LaFontaine was an immense talent, but, perhaps inevitably, also in the right place at the right time! Best of all, his closest friends say that despite being so famous and so successful, his ego never grew or got in the way of his work. From Washington DC, J.Michael has been in the business for more than twenty years. He booked his first job at the age of fifteen while working in radio. Additional bookings followed from people who’d heard his voice on air. By the time he was out of college, J.Michael was making a small but respectable living doing voiceovers. When confronted with the choice of going to law school or focusing his energies on pursuing a voiceover career, J. Michael chose voiceovers. While his family thought he was nuts, it turned out to be the correct decision for him. He’s done numerous national and international TV commercials, movie trailers, a few documentary series, and is feeling very proud (and honored) to have been nominated for the 2016 Voice Arts Awards—both as talent and as demo producer. He is a big believer in training; people who are successful both online and in other parts of the industry at large, are people who have taken the time to learn and hone their craft. Proper coaching and learning how to act is key, he says. These days, you need to be a voice-actor, not just someone who does voiceovers. Based in a small town south of Portland, Oregon, Michelle is a voice-actor and singer/songwriter, so a microphone has always been part of her life. She’s been doing voiceovers on-and-off for ten years, but didn’t take it seriously until she decided to make use of the services of a voice coach a couple of years back. Coaching allowed her to hone her skillset and build her confidence. She’s been doing voiceovers for the United States Postal Service (USPS), a variety of video games, and also regional television commercials. The key, she insists, is respecting and coming to grips with every script she receives, because she takes great pride in her work. She has a roster of repeat clients, and focuses on building her relationships with them. Michelle feels it’s important to continue learning; to have a voice coach, and to attend classes, but It’s equally important to have great quality equipment. The road to success is not easy to navigate, but with hard work and passion, you can become part of this successful group. A Toronto-based Canadian, Bev was working as an inspector for an engineering firm when she decided she needed to do something different. The result was a local voiceover workshop which she enjoyed so much she started taking improv and acting classes. More voiceover workshops followed, and then one day out of the blue, she was asked to audition for a local radio station’s tagline. While she didn’t get the job, she loved the recording experience and decided a career change was in order! 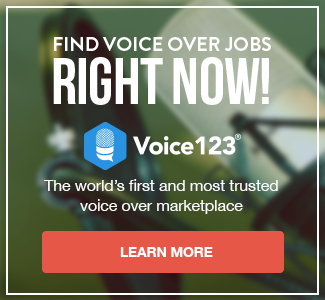 It was after attending a conference in Ohio, and exposure to the burgeoning online voiceover environment that Bev decided to join Voice123. Networking, as well as meeting successful voice-actors and learning the ropes, built her confidence in her own abilities and she was soon auditioning like a pro. Online platforms suit her lifestyle particularly well. Persistence is key, too – because one thing leads to another. Bev strongly believes in building a trusting relationship with her clients and they keep coming back for more because of it. She was even nominated for a Voice Arts Award in 2016. It’s important to be picky about the jobs you audition for, she says – and demos have to be great. Persistence, perseverance and an absolute commitment to her craft has turned Bev Standing into an outstanding, versatile and very popular voice-actor. Hailing from Wichita in Kansas, Rick has been in the broadcast business for 40 years, he says. It clearly runs in the family because his father was a radio personality, too! It’s true, of course, that the voiceover profession has been dominated by men with deep, resonant voices for a long time. Times and tastes are changing, however, and it’s great to see that women, in particular, are becoming more and more sought-after and successful practitioners of this artful craft. We trust you will be inspired by these success stories; there’s no reason why you can’t become equally successful!